On a recent trip to Rite-Aid with my older daughter, I warned her: "I don't know what it is about this place, but I always spot tattoos here." In fact, at least three prior posts on Tattoosday have featured ink photographed under the drugstore's fluorescent lights. She has a dozen dragons in all, including two on her lower back for her children that she couldn't show me in the store. Those, representing her kids, are her favorites. However, for the purpose of modesty, I snapped shots of the two on the outside of her calves. When I asked her her name, she said I could use her surname as well. "I'm proud of my tattoos," she smiled, "I have nothing to be ashamed of". Tani has 15 tattoos - Here's One! I rain into Tani on 5th avenue in Bay Ridge on Thursday. She has multiple tattoos, on her arms, peeking out from the edges of her shirt on her back, and many that were out of sight. 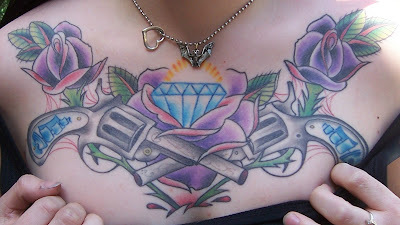 She offered up this piece on her left biceps, although she admitted her favorite tattoo is on her ribs. Understandably, that wasn't seeing sunlight on a crowded street. This piece was tattooed by Jennifer at Ink Masters on 3rd Avenue in Bay Ridge circa 1998. Tani indicated that she is half-Chinese, and that the Asian aspects of the design appealed to her. The two main elements are the phoenix and the tree, which she identified as a Japanese Maple. People with a lot of tattoos, I have discovered, either know exactly how many they have, or aren't sure, and have to try and figure it out. When I asked Tani the inevitable question, she did not hesitate. Fifteen in all. "So," I asked, "are you getting any more?" "No" she laughed, "I'm pretty much done." Thanks to Tani for sharing her phoenix and maple with Tattoosday! Thursday (April 17) was the most beautiful day yet this spring, but I was at work sans camera and passing out Tattoosday fliers without the possibility of taking pictures seemed lame. Remember, this blog is not just about tattoos, but about the pursuit of interesting tattoo stories as well. Thanks to Brooke, however, I was armed with a camera phone on my lunch break, as I ran a couple of errands. 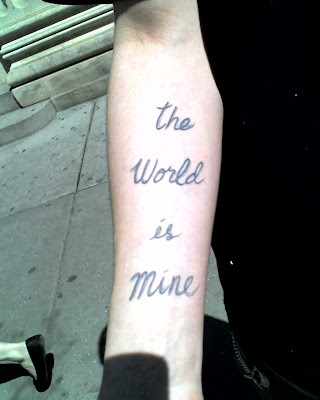 Our tattoo host said that it's a quote from the film Scarface, one of Tony Montana's many mottos, delivered with gusto by Al Pacino. 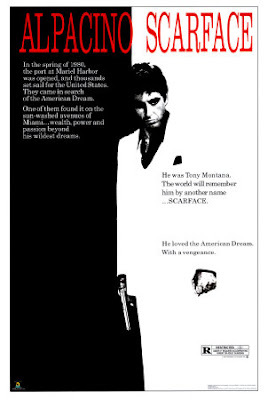 I couldn't find any direct quotes on the web, but it makes sense, based on the existence of a video game called Scarface: The World is Yours. It's a celebration of his Irish ancestry. They're just outlines right now, but he plans to fill them in with green, orange, and white ink, to represent the flag of Ireland. Both of these tattoos were inked at Groove Tattoos in Bay Ridge, Brooklyn. When I mentioned that I had work from Body Art Studios, he flashed some print on the backs of his biceps, indicating that those were inked there too. Thanks to our anonymous friend for sharing his ink here at Tattoosday! To break the tattoo down a little, the quote in the banner is “When I got the music/I got a place to go,” which are lyrics from the song "Radio" by Rancid, from their 1994 album, Let’s Go. A little research proved that “Radio” was originally released on the Radio Radio Radio EP a year earlier, with Green Day’s Billie Joe Armstrong as a second guitarist in a brief stint with the band. Armstrong is even shares writing credit on the track. The album version, post-Bille Joe, has a significantly different arrangement. He explained that the tattoo exemplifies the role of music in Steve's life. He finds it very therapeutic and acknowledges that, without music, "I would not be the same person I am today, or even be here at all." It's the biggest, most important thing in his life. This is a direct quote from the Clash song of the same name from the London Calling album. Pepe at The Tattoo Shop did this piece and it represents Steve's belief that he'll be able to make an impression on this world before he dies. In the course of talking to Steve, the young lady with him was an active participant in the discussion. Her name is Krista and she works as an apprentice at The Tattoo Shop where Steve's work was done. She said she had about six or seven tattoos in all. After talking with Steve, I asked her if she would like to show off her ink for Tattoosday as well. Krista was born in upstate New York but she grew up in North Carolina. She remembers always being fascinated by the "Western motif" and when she drew up the rudimentary sketch of this tattoo, this was in the forefront of the vision. She took the basic premise to a tattooist named Zam at Visionary (a custom shop). She told him "this is [basically] what I want. Go nuts with it." Like I said, the end result is breath-taking. I believe this is Tattoosday's first chest piece. 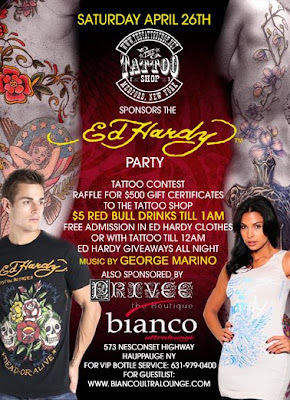 Krista wanted me to plug her shop's show on April 26th at Club Bianco in Hauppauge. Check out The Tattoo Shop's page here to get all the details. Mat: Well, it's actually a simple one. I have a love for African black elephants: their patterning, symmetry, ear structure, [and] demeanor….and the platelets of jewelry and Tibetan skull crown symbolize a Tibetan tradition. Mat: Nope, a friend that sleeved both of my legs started the basic line work….and in Orlando, I ran into this up-and-coming fella, BJ, in a bar. He whipped out his digital camera, took some snapshots, said 'don't make any plans on Sunday'. He went, bought some reference books, and free-handed the entire thing. Four sittings total, about 25 hours. Me: ...Custom meaning, by appointment only, no flash on the walls, all original work, right? Mat: Yeah, no flash basically. That's the point I wanted to make. I was intrigued. 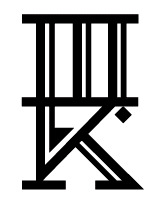 I'll call it a "tat-tease," because you only get a glimpse and have no idea what the fragmented piece is linked to. You have an inkling, but the only way to find out what the whole thing looks like is to ask. This is what I love about Tattoosday. What first appears to be merely a tail of ink turns into something so much more interesting. Nick explained the piece. He found the design on a site called deviantART.com. I think I remember hearing about the site, so I checked it out when I got home. No luck finding the art in question (there's tens of thousands of images). Nick said this piece of art spoke to him, reminding him of being young again. Young meaning, childhood. "It captures my dreams," he explained, adding that, as I understood him to mean, the art opened up a whole world of possibilities to his imagination. What's great, in my opinion, about tattooing a work of art onto oneself, is that the meaning can change over time, and can evolve along with the individual. This piece is very simple, yet its context is cool. The clouds, as well, add texture to the overall piece, and develop the landscape of the flesh. 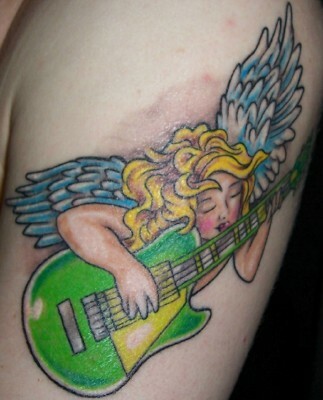 This piece was inked in 2007 and was Nick's second tattoo. He has since had two more added. This was the only one visible. He resides in Brooklyn but got this piece at Marc's Tattooing and Body Piercing in Wilkes-Barre, Pennsylvania. Dani was the tattooist who inked the piece. Thanks to Nick for sharing his cool tattoo with the rest of us here on Tattoosday! On deck: An amazing back piece from Texas! All of her work is in black and gray. 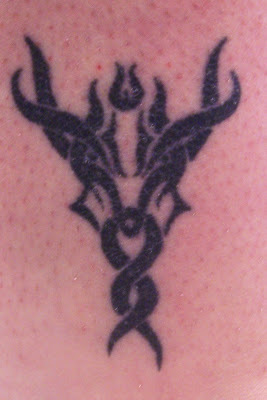 This piece is a tribal design, and is Satanic in origin. Courtney explained. She was a lapsed Roman Catholic who became involved in the Church of Satan. 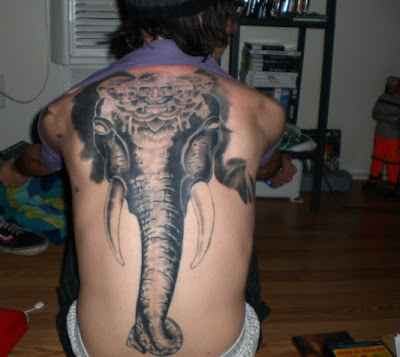 This piece is about 5 years old and was inked by Richie at Tattooing by Richie in Elmont, Long Island. Incidentally, Courtney is no longer affiliated with that lifestyle and has returned to the Catholic Church. She says she was going through a phase and was experiencing teenage angst. I had a nice chat with her about tattoos and how she is finding it challenging because she has a corporate job now, and finding attire that covers her ink appropriately can be tough. This almost limits her in her choice to get any more work done. From what I can recall from our conversation and from seeing what was visible, she has three or four pieces in all on her legs, a tribal design on the lower part of her neck, an ankh on her lower back, and another piece on her right biceps. She did not show the biceps or lower back tattoos. I explained to Courtney my policy is generally not to ask people, who are generally women, if I can photograph their lower backs. If they offer (like this woman did), I will snap away. Thanks to Courtney for being so cool, talking tattoos with me, and sharing her Satanic piece with Tattoosday! Here's hoping she'll make a return visit here in the future! When I went to my wife Melanie's twentieth high school reunion last weekend, I wasn't expecting to come away with a story and a photo for Tattoosday. In fact, as I had to arrive a little late, Melanie had the camera with her, so I was only travelling with a few fliers, just in case I ran into a tattoo or two en route to the Upper West Side. It's usually when I have no fliers that I wish I'd had the foresight to bring them. I arrived an hour late, and so was a bit behind the curve on introductions. I recognized names on name tags, but there were also many people untagged. And when the call came out for the reunion class to assemble for a photo, I was left behind with a trio of women. "Spouses?" I asked. Close. One spouse, one fiancée, one girlfriend. 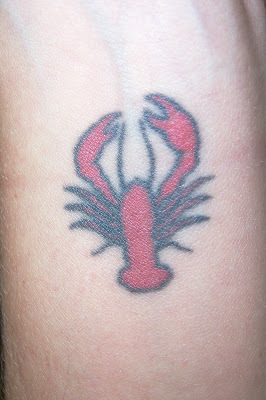 Yes, Katherine Pushkar has a tattoo of a lobster on the inside of her forearm, just below the wrist. It was inked circa 2000 in one of the many lower East Side tattoo shops, the name of which, along with the tattooist, is lost to memory. Katherine, who is currently an editor at the New York Post, used to be an editor at The Village Voice. As she tells it, the editorial job oversaw, among other things, the food critic. She occasionally would go out to dinner with the reviewer and the menu would inevitably feature seafood. The problem was, Katherine didn't like and didn't eat seafood. Now I am totally with her on this. Aside from tuna salad, I abhored seafood growing up. And I grew up in Hawai'i. Even now I admit that I missed out due to my pickiness. I have gradually evolved into the occasional sushi eater, a taster of Melanie's dishes, but I still largely remain a non-seafood kind of guy. Katherine, on the other hand, understood that her distaste for creatures of the sea was an issue she had to deal with and so she took the plunge. She realized she needed to learn to like seafood and she chose to take the first step in Nantucket and ate her first lobster. The rest is history. From that point on, she no longer suffered from the menu laden with fish dishes. Fast forward to a tattoo shop in the East Village. She and her friend were getting their first tattoos. Her friend was the driving force, looking to get a lower back tattoo. Her friend was set but Katherine was still trying to decide what was best. Still proud of her expansion of her palate's horizons, she explained the concept to the tattooist who found the lobster in a book of flash art. The rest is history. And, Katherine concluded, while her friend's affection for her back tattoo has waned over the years, she still wears her lobster ink proudly on her wrist. It serves as a constant reminder, Katherine beamed, that "I can change if I want to." Thanks to Katherine for her sharing this story, along with her tattoo! Confounded by poor timing and fluctuating temperatures, I have slumped lately getting new material up here. However, I sense a shift in the tide, and have this latest encounter to relate, with photos to boot. It was turning a little chilly on a Friday afternoon when I walked by a guy eating his lunch on the plaza outside of the Borders above Penn Station. This has been a bread and butter spot for me: plenty of sun and people not in a hurry to go anywhere fast. I noticed he had ink on his neck but I couldn’t tell what it was and it looked interesting. 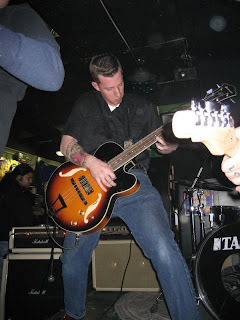 Turns out, this was Brian Murphy, a tattooist from Pennsylvania who is doing a guest artist gig from April 10-13, 2008 at Paul Booth’s Last Rites “Tattoo Theatre” nearby. Brian works out of Third Dimension Tattoo in Marshalls Creek (in the Poconos, north of Philadelphia in the Eastern end of the state). First a production note: people are always giving me advice on where to find tattoos. “Go to shops,” they say, “hang out in front and get people as they are coming and going.” Great idea, really, but not in the spirit of Tattoosday. A lot of the fun is meeting people by chance and interesting them in the blog enough for them to want to contribute. Going to a shop and asking people about their tattoos seems a little easy. Not to knock the idea, but it takes some of the fun out of it. Similarly, I wouldn’t want to bother an artist in shop with my little venture. But to find one randomly on the street. 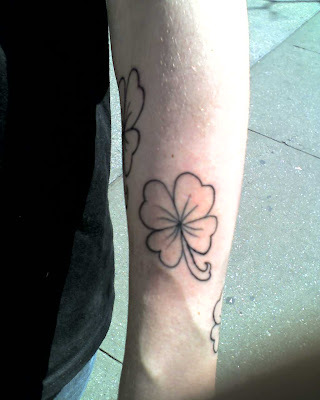 That’s good fortune shining down on Tattoosday, especially when the individual is as friendly as Brian Murphy is. 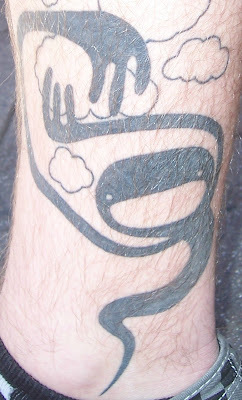 Brian said that Kyle, who is a friend of his, gave him this tattoo in exchange for one from Brian. The image is that of a homeless man. It represents a life that Brian once had, when he was homeless for a brief time. He is no longer in that situation, so the dichotomy of the piece lies in the half that represents the past, as it is disintegrating, and falling away from the foreground, where the new self is represented. The present and future are represented by the expression in the face, showing happiness of getting one’s life back. I’ve asked Brian to ask Kyle for a photo of the piece that he received in exchange for inking this one on Brian. They would certainly be interesting to see together. Brian also wanted to show me a piece on his left leg designed and tattooed by the world-renowned artist Robert Hernandez, who works out of Vittamin Tattoo Studio in Madrid. There’s no significance to it, he told me, “that’s just what he does”. Indeed, an amazing piece. Brian also told me about a cool tattoo site called TattooNow.com, which I have added to the blogroll. Thanks to Brian for sharing these two amazing pieces with Tattoosday!